With the spherification technique you can make little spheres that resemble the shape of real caviar. The spherification caviar is made by releasing small droplets of the flavored liquid into the calcium bath using a syringe or a Caviar Maker. Making spherification caviar is fun but it can be a draining process to make enough for a few cocktails or dishes one drop at a time using just a syringe or squeeze bottle. With the Caviar Maker you can now multiply the production by 96 times with no extra effort! 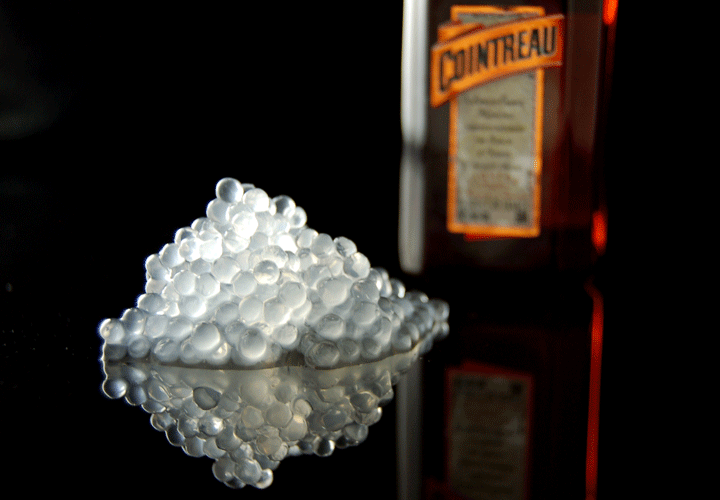 Here are some tips to master this fun molecular gastronomy technique created by Ferran Adria and El Bulli team. Watch video below for a quick overview of basic spherification and making caviar with a syringe or a caviar maker. 1- Use Basic Spherification: spheres tend to stick together when made with the Reverse Spherification technique so it is better to use Basic Spherification when creating spherification caviar since you have to produce many little spheres and they will inevitably come in contact with each other. 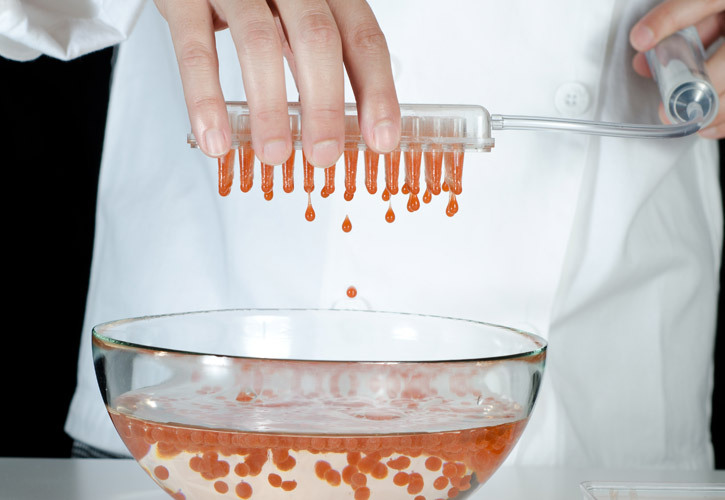 The low viscosity of the bath in Basic Spherification will also make it easier to form small “caviar” spheres as it will allow the droplets to penetrate the bath surface with their small weight. 2- Release the droplets from the right height: to avoid getting flattened or oval spheres, the droplets should have enough distance from the surface of the calcium bath so that they have enough time to cohere into a sphere and enough speed to penetrate the surface and sink. Don’t go too high up or the impact with the bath will deform them and you will end up with flattened caviar. You can also try a more diluted calcium bath to give time for the drop to cohere in the bath. 3- Apply constant pressure to the syringe pump: to obtain caviar spheres of consistent size, push the syringe pump at constant pressure and slow speed and allow the droplets to break away from the tip of the syringe on their own without tapping or shaking the syringe. Try holding the syringe horizontally to obtain more control and slightly larger caviar spheres. This process is much easier with the Caviar Maker as the results do not vary by how you press the syringe pump. 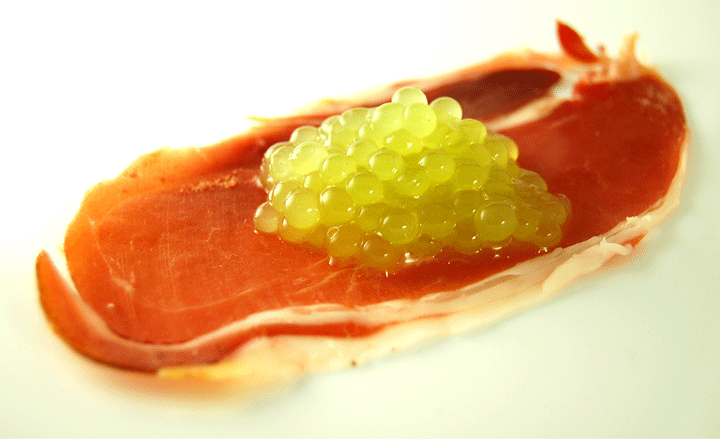 4- Regulate main ingredient acidity: basic spherification does not occur if the main ingredient is acidic (PH<3.6). You’ll also have trouble dissolving the sodium alginate if the acidity is high. Add some sodium citrate to reduce the acidity but be careful with the amount you add or the main ingredient will become too salty. 5- “Cook” the spheres for less than 1 min: you want the caviar spheres to have liquid inside so just let them rest in the bath for a minute or less or they will become a jell ball. This could be a challenge if you only have one syringe and you are planning to make enough caviar for a few servings. At the speed droplets come out of one syringe you probably need a minute to make enough caviar for one serving so this means the first caviar sphere will be ready when the last droplet touches the bath for the first time. And because all the little spheres get mixed in the bath, you usually fish them out of the bath all together. An easy solution is to produce them in batches and serve them to one diner at a time. Another solution is to use an array of syringes or a Caviar Maker to produce a large quantity of caviar in a short period of time. 6- Use a bowl for the bath and a round sieve to fish the caviar: this will make it easier to fish all the caviar at once. If you use a rectangular container it will be harder to catch the spheres in the corners. 7- Serve immediately: remember that spheres produced with Basic Spherification continue to gel even after they are removed from the calcium bath and rinsed with water. You need to serve them immediately after preparation to delight your diners with a caviar sphere with subtle membrane and liquid inside.